I don’t know about you, but when my kids come home from school, they are HUNGRY! The first words out of their mouths are, “hi mom, what’s for snack?” I get it, they’re growing fast, had lunch a couple of hours ago and so they need some fuel, and they need it NOW! When Zoe gets home and smells something baking in the oven, she does her leap of joy and yells a big “Yippee!” It doesn’t get any better than that. Here’s a great fall afternoon snack, or anytime of the year snack. It almost qualifies as a dessert, because it’s that yummy. I serve this up for the kids with a tall glass of milk, and after its devoured, I get that sigh of contentment and the rubbing of the belly! I made a few variations to the original recipe to make it healthier. The original recipe called for 1/2 cup of vegetable oil. I’ve replaced that with 1/4 virgin coconut oil and 1/4 cup unsweetened applesauce. I’ve also tried it using 1/4 cup vegetable oil and 1/4 cup unsweetened applesauce. I’ve also added in 1/4 cup plain Greek yogurt at times to give it a bit more moisture. All 3 variations have been wonderful, so play with this bread and make it your own, and let me know your favorite way to enjoy it! Note: If you want to add a bit more moisture to this bread, then you can add in 1/4 cup plain Greek yogurt to the wet ingredients. 1 cup pumpkin puree – my favorite brand is Farmers Organic Pumpkin and I love that the cans are BPA free. Note: If you’re not a fan of coconut oil, then you can use 1/2 cup vegetable oil, just make sure to omit the applesauce in the recipe. You can also use 1/4 cup vegetable oil and 1/4 cup unsweetened applesauce. Pre-heat oven to 350 degrees and grease up a Bundt pan. 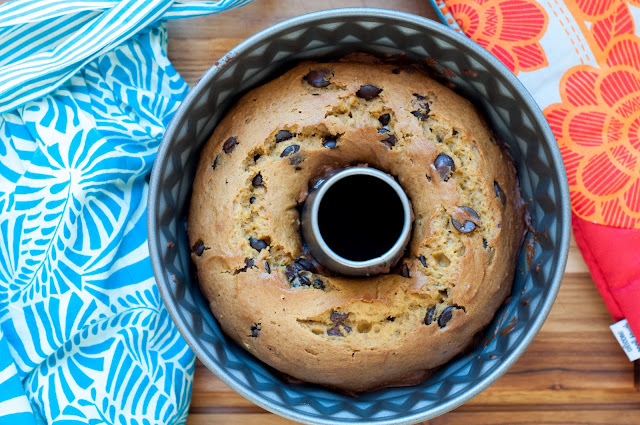 I always use a paper towel and some room temp butter to grease up my Bundt pan. Make sure that you grease the pan up along edges and middle. Measure out an overflowing 1/4 cup of coconut oil using a dry measuring cup. Add the solid coconut oil to a small pan and turn the heat to simmer. Simmer the oil, using a spatula to stir it occasionally, until it melts. Pour the coconut oil into a glass measuring cup just to make sure that you have 1/4 cup. Set it aside to cool a bit. It won’t have to cool too much as it won’t be that hot. 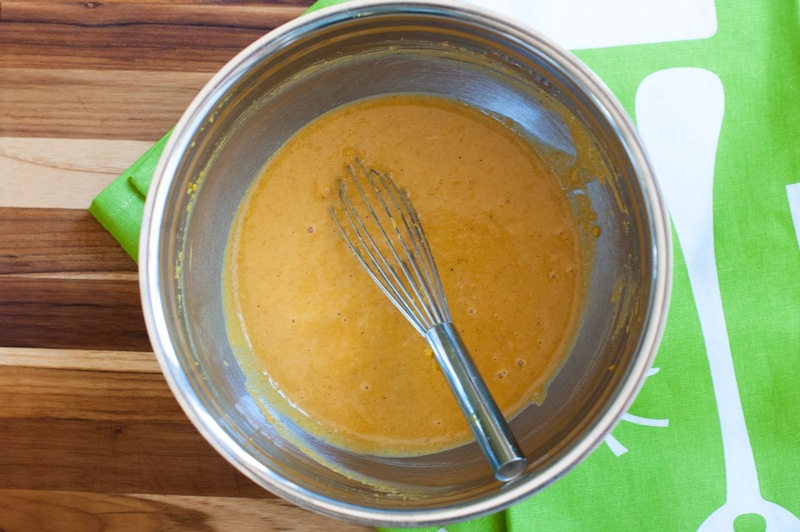 Whisk together the 1 cup pumpkin puree, 1/4 cup coconut oil, 1/4 cup applesauce, 2 large eggs, 1/4 teaspoon nutmeg, 1/4 teaspoon cinnamon, 1/4 teaspoon allspice and the 1/4 teaspoon pumpkin pie spice until well combined. Whisk together the 1 1/2 cups flour, 1/2 teaspoon salt, 1 cup sugar, 1 teaspoon baking soda until combined. 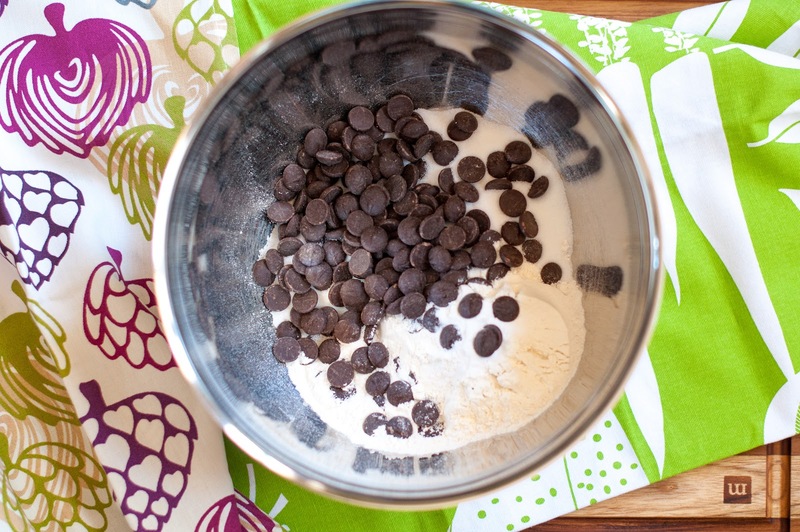 Add in the 1 cup of chocolate chips and give it another stir. Using a spatula or wooden spoon mix the dry into the wet until JUST combined. Spoon into the Bundt pan and even out slightly using a spatula. 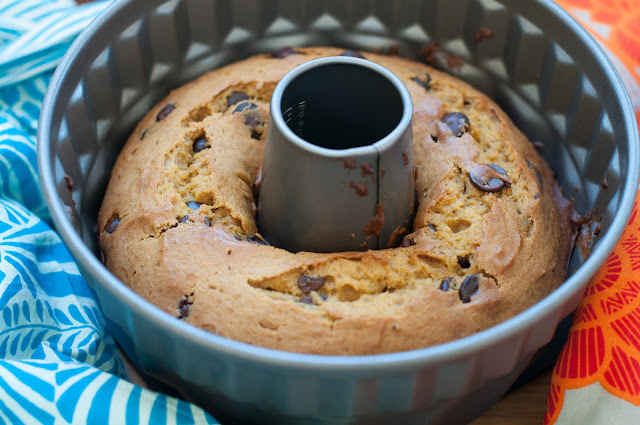 Give the bundt pan a slam on the counter to release any trapped air and to help the batter get a bit more even. Bake until a toothpick comes out clean, about 42-46 minutes. Different ovens have different baking times, so the baking time is just an estimate here. Baking tip: It’s hard to give an exact cooking time when it comes to baking because every oven, pan and even geographic locations, can command a slightly different cooking time. A great way to know when a cake is done, is to do the finger test as well as the standard toothpick test. To do the finger test, press your finger down gently in the middle of the cake, if it’s done, it should puff back up automatically on it own. If it stays dented, then the cake is not ready to come out yet. Also, a cake tester or toothpick inserted in the center should come out clean as well. Cool briefly and turn out onto a plate or rack. Enjoy this as a snack with a tall glass of milk, some tea or coffee, or add some vanilla ice cream and have it for dessert. If you want to add a bit more moisture to this bread, then you can add in ¼ cup plain Greek yogurt to the wet ingredients. Note: If you're not a fan of coconut oil, then you can use ½ cup vegetable oil, just make sure to omit the applesauce in the recipe. You can also use ¼ cup vegetable oil and ¼ cup unsweetened applesauce. 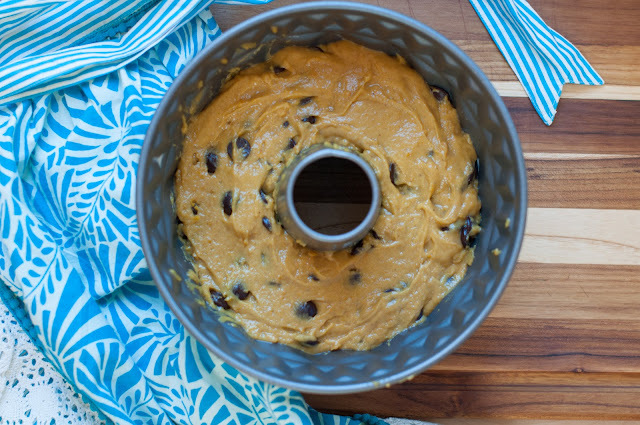 1 cup pumpkin puree - My favorite brand is Farmers Organic Pumpkin and I love that the cans are BPA free. Measure out an overflowing ¼ cup of coconut oil using a dry measuring cup. Add the solid coconut oil to a small pan and turn the heat to simmer. Simmer the oil, using a spatula to stir it occasionally, until it melts. Pour the coconut oil into a glass measuring cup just to make sure that you have ¼ cup. Set it aside to cool a bit. It won't have to cool too much as it won't be that hot. In a large bowl, whisk together the 1 cup pumpkin puree, ¼ cup coconut oil, ¼ cup applesauce, 2 large eggs, ¼ teaspoon nutmeg, ¼ teaspoon cinnamon, ¼ teaspoon allspice and the ¼ teaspoon pumpkin pie spice until well combined. In another bowl, whisk together the 1½ cups flour, ½ teaspoon salt, 1 cup sugar, 1 teaspoon baking soda until combined. Add in the 1 cup of chocolate chips and give it another stir. Using a spatula or wooden spoon, mix the dry into the wet until JUST combined. Spoon into the Bundt pan and even out slightly using a spatula. 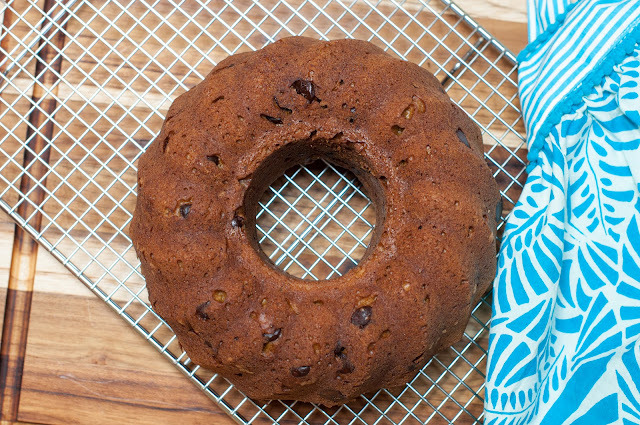 Give the bundt pan a slam on the counter to release any trapped air and to help the batter get a bit more even. Bake until a toothpick comes out clean, about 42-50 minutes. Different ovens have different baking times, so the baking time is just an estimate here. Cool briefly and turn out onto a plate or rack. Enjoy this as a snack with a tall glass of milk, some tea or coffee, or add some vanilla ice cream and have it for dessert. Do you have any experience with Convection ovens not baking with as high a rise on cakes and breads? We moved into our new home a year ago and my convection oven makes lopsided muffins and my bundt cakes and this bread are only rising 1/2 the height of the pan. Tasted the bread and it was still delicious…. This has happened with homemade as well as with a boxed cake mix. Frustrated. Love this recipe by the way!! Honestly I don’t use the convection feature in my oven because I feel like I can’t get it right. I would read your oven manual, as it will tell you the right temp for baking items with the convection feature. You usually have to put the heat at a lower temp, like 25 degrees lower than what the recipe calls for. If you’re finding the convention isn’t baking to your standards, then don’t use that feature and just bake without the convention feature. I bake everything normally in the oven. I am amazed to see how long ago this recipe was posted–I have been making it, frequently, since you shared it. I have a piece of this and a spoonful of almond butter all the time for breakfast. In fact, I often make multiple batches of the dry ingredients and freeze them, to save time when I’m ready to bake. I don’t use the chips though–I don’t love chocolate and pumpkin, and basically I just think this is so delicious the chips aren’t necessary. I do the version with apple sauce and vegetable oil, and I always use the yogurt. I also make it with white whole wheat flour, with no issues. Anyway, thanks so much for this recipe–one of my all-time favorites. These are so great! I followed your recipe exactly, with the addition of suggested yogurt and an extra 1/4 tsp of cinnamon since I was out of oumpkin pie spice. As I didn’t have a bundt pan (where did that pesky pan get to?) I cooked it in an oblong pan for 40 min and it turned out great. Preschool party hack: I covered the still warm cake with the rest of the dark chocolate chips leftover from the 12 oz bag, waited 4 minutes, then spread gently across cake/bread for a perfect quick easy frosting. Cut them into 1″ squares and they were devoured by kids and adults! Thank you for another great recipe! Jackie, We love this bread! Was there an earlier version of the recipe? I don’t recognize some of the ingredients — but I could just be loosing my mind! it just looks so delicious! thanks for sharing! Have you ever made your own pumpkin puree? 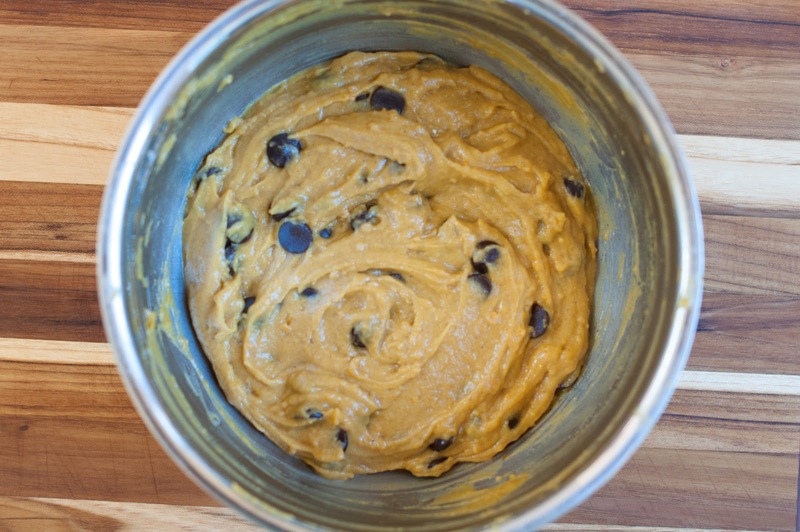 I just made some and used some in my normal pumpkin bread recipe. The puree is not a thick as what is in a can, so I was thinking about adding some applesauce to the puree? What do you think? Hope you are having a good Saturday, it is a beautiful fall day here in Virginia! those are my favorite chocolate chips! totally pinning this recipe. Jackie, I have made this recipe a handful of times since you first posted and have to say, it is delicious! I have made when family has come to town and it is a hit. Especially over Thanksgiving, when the dessert of choice with one family member was a piece of this instead of pumpkin pie or carmel pie. One thing I do, though is double the pumpkin, makes for a very moist and dense flavor. LOVE! Hi Cathy! So good to hear from you! Ilse told me you made the bread a couple of times. I love your addition of doubling up the pumpkin. I’m so going to do that next. My friend Averie tweaked this recipe as well, and I made it with her tweaks but have yet to post it. She made it moister by adding Greek yogurt and decedent by adding chocolate gnache to the top! So good, and it takes the bread from an afternoon snack to a dessert. Jackie-two thumbs up from my kids!